We’re blessed in the UK to have the sort of climate that supports a really diverse range of plants. Some of the most distinctive, have to be the sedums. Able to grow in very little soil and often found in rocky areas – hence their common name of stonecrop. Among the sedum species in the UK you’ll find different growing habits, different shaped leaves, different coloured blooms and different ways of arranging their flowers – but they’re all rather beautiful. Let’s take a look at a few of them…..
Sedum Album - tiny white flowers on arching stems - lovely! Otherwise known as the White Stonecrop – this one is native to the UK. When you see it flowering en-mass you’re reminded of clouds of candyfloss. The flowers are white with a hint of pink and several flower heads are held aloft each spring on an arching stem. The leaves are shaped like jelly beans and turn from grey-green in spring and summer to a lovely cherry red in the winter time. Also called Gold Sedum. This is a low growing species with flat, boat shaped leaves and stunning yellow flowers in June and July. Widow’s Cross. The foliage for this sedum plants sits low to the ground and looks like lots of little jelly beans clinging to a stem but the joy for me is in the flowers. Normally we get two flushes of flowers every year; one in the spring, one in the autumn. A single stem points to the sky and then breaks out into four fronds, each one covered with tiny baby-pink flowers. Some call it widow’s cross but I think it looks like a firework. Crooked Yellow Stonecrop. This plant’s foliage appears spikey but it really isn’t. Again, it’s a low growing plant with evergreen leaves. These leaves are often a pale grey-green colour which add a different colour and texture to the garden. In mid-summer, stems of yellow flowers stand proud of the leaves – there’ll be a dozen or more clear yellow flowers perched at the top of each stem and proving themselves to be irresistible to insects. Two-Row Stonecrop. My favourite sedum. This one blooms in mid-late summer and brings butterflies from miles around. The flowers are arranged in big clusters on one stem so they look like large plate-shaped flower heads in various shades of pink. Colours range from a delicate pale baby-pink to a raving hot pink. A buff-tailed bumblebee enjoying the flowers of Sedum spurium. This plant is also a favourite of peacock butterflies. This is another low growing sedum species that thrives in any sunny spot and soon spreads to cover every spare centimetre of ground. Tasteless Stonecrop. I do love the foliage on this little plant. It’s like little whorls of triangular shaped leaves arranged round a central stem. It takes six leaves to surround the stem at each level – hence the name Sexangulare (six angles). The bright yellow flowers in early spring are an absolute joy. Biting Stonecrop. This is another UK native with a particularly interesting history. 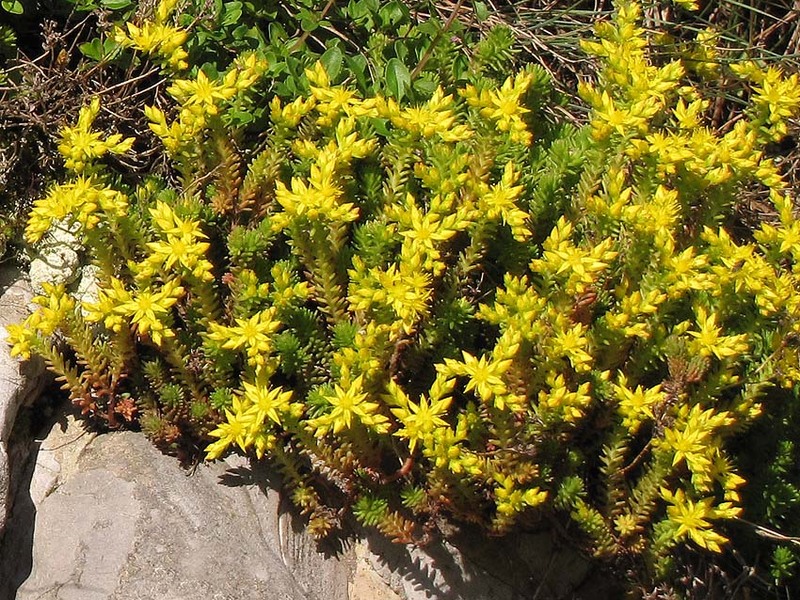 It’s not unusual to find Sedum Acre growing on the site of old monasteries – why? Because it has medicinal properties. Apparently the monks used this plant to treat haemorrhoids. I’m not sure how but some say the name “sedum”, comes from the Latin term that means “to sooth” and sedums are fairly closely related to aloe vera which makes a very nice skin cream. Sedum Acre has a particularly nasty taste – hence it’s common name of Biting Stonecrop. The Romans used to refer to it as Wall Pepper. If you’ve ever bitten into one of the leaves (not to be recommended), you’ll know why. There are over 400 different species of sedum plant in the world with a myriad of different varieties within each species. These are such easy-going, low maintenance and beautiful plants that they deserve a place in every garden………where will you plant yours?